There’s something really special about a perfect creamy tapioca pudding. For a delicate dinner party version try serving a quenelle with the syrup and add whichever fresh fruit you like best. I love the idea of adding a dash of dark rum to the syrup for a little extra punch. Feel free to leave the chilli out… but, trust me, the spicy kick is pretty more-ish with the creaminess of the pudding. Fresh fruit like mango, citrus, nuts or coconut flakes. Place all the ingredients in a saucepan except for the lime juice, and bring to the boil. Lower the heat to a simmer and reduce liquid by about three-quarters, the syrup should be the consistency of a runny honey. Take the syrup off the heat, add the lime juice (and rum if using). Strain the syrup through a sieve, reserve. Meanwhile, in a saucepan bring all the ingredients to the boil, stirring continuously. Place a spoonful of pudding into a small bowl. 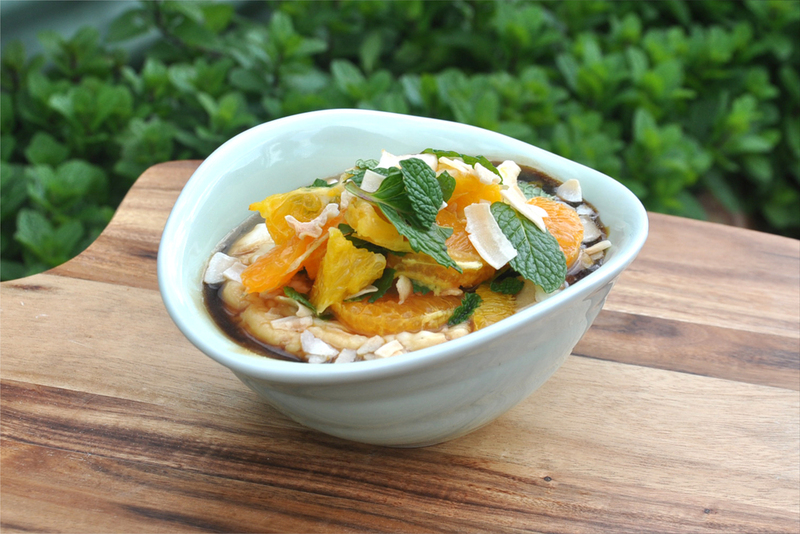 Top with the syrup and seasonal fresh fruit like mango, citrus, mint, nuts or coconut flakes. I like to use the dark sticky organic sugar for this recipe, however standard brown sugar will work just fine too.